If you can access it - there are plenty of recent films in Russian. I've been through Pimsleur Russian 1 and 2 twice already. Moving through Russian 3 for the first time, and I just finished unit 8. What is the next best step to take to prepare my conversational ability for a trip to Moscow this summer? (03-08-2016 04:45 PM)texrifle Wrote: [ -> ] I've been through Pimsleur Russian 1 and 2 twice already. Moving through Russian 3 for the first time, and I just finished unit 8. What is the next best step to take to prepare my conversational ability for a trip to Moscow this summer? I'd suggest practicing online with someone, or in person if it's an option. If you can't find anyone to really language exchange for free, there are a few sites where you can hire a teacher through skype. I had my first Chinese lesson online today, and actually having dedicated one-on-one time to go through pronunciations and tones with someone was far superior to just listening and reading. So I am going to put some more effort into vocabulary. sam did you get the link i sent you a while back? (03-17-2016 01:59 AM)samsamsam Wrote: [ -> ] So I am going to put some more effort into vocabulary. Download anki to your computer and phone. Write the words into anki, might even add spoken words from forvo.com onto the anki deck. Use anki every day when you have some extra time. (03-17-2016 03:11 AM)Beirut Wrote: [ -> ] sam did you get the link i sent you a while back? Not sure which link. I purged all my PMs. Resend it please? Thanks. I'm struggling with pimsleur. Is it normal to have to repeat the same lesson 2 or 3 times? I know you're not supposed to move on to the next lesson unless you've understood 80% of it. Spaced repetition with vocab works best. Initially I also found that 1000 most commonly used word list from Master Russian. However the problem is that is it's just a big list with no context. You also do flashcards for Russian to English, English to Russian: spoken and written. flashcards all prepared for you. It takes less time. I dont know if it's normal, but I've sometimes repeated the same pimsluer lesson 10 or more times before really getting it. The language is totally alien if you've grown up speaking only English your whole life. I've learned that while learning this beast, it's most important to toss my ego to the side, and accept that despite how smart I thought I was, to stay in humility & respect of the difficulty of this language. (03-18-2016 02:48 PM)Courage Reborn Wrote: [ -> ] I dont know if it's normal, but I've sometimes repeated the same pimsluer lesson 10 or more times before really getting it. Well that's a relief, it's not just me then. (03-18-2016 12:20 PM)Apollo21 Wrote: [ -> ] Spaced repetition with vocab works best. Beginners that are struggling with the grammar can probably benefit from focusing on one sentence at a time and trying to deconstruct it to check for agreement (e.g the ending of a particular noun to notice its gender, then focus on any adjective that describes the noun, try to notice prepositions and what cases they're followed by e.g из, от, в, на etc or try to think why a particular noun is in a certain case). I think this type of analysis is important due to the lack of gender and cases in English. Anyone find a good resource that actually takes a russian verb and shows it in use? Some verbs are imperative and perfective, but some don't seem to translate well and would like to see it in use. It helps me to get a more solid understanding. Thanks. You can try http://www.google.ru/news and search for the verb, then you will (hopefully) get some articles which uses the word. I tried it and the results pleased me. And you also asked a couple days ago what we think is the best way to learn vocabulary. You can try to monogolize and translate simple things you do in your day to day life. It's always easier to remember vocab which you are using daily by yourself. For sure it's hard to memorize vocab about rocket science when you don't interact with that kind of topic from time to time. This is at least my experience. For example when I cook or something similar I say it loud in russian. -- Now I will cook a soup. Which soup? A soup with potatos. = Сейчас я приготовлю суп. Какой суп? Суп с картошками. -- Then I will read a newspaper. = Потом я буду читать газету. Or for example when you are at the supermarket. Say everything in russian which you put into your shopping cart. -- I pick apples: I say "Яблоко" and often followed by the plural form just for practice reason -> "яблоки". Write them down, by hand, not with your pc. This helps tremendously. Put them on small cards and have them with you in your pocket or so. When you wait at the bus for example you could pull them out and learn them. .. and so many other ways. But keep in mind that all the suggestions are for the birds if you don't possess adequate intrinsic motivation. (03-01-2016 08:12 AM)The Ligurian Wrote: [ -> ] I recently read a book about the Russian language that I can highly recommend to learners of the language. 'The Russian Word's Worth' is a huge 450 pages of Russian phrases, slang, idioms and insights into Russian life you will not find so well laid out and accessible in any other book. The author moved to the USSR from the States in the late 70's and has lived in Moscow ever since working as a translator and journalist. This book is a compendium of much of her knowledge. The book contains hundreds of phrases and words that you would be hard pressed to find the meaning of anywhere else. How many of us intermediate learners even know the meaning of such phrases as девушка с приветом or кольбаситься or чесать языком or мы будем в шоколаде? Well I didn't anyway. These are the kind of phrases that will take your Russian from text book or classroom language and onto a more natural way of speaking and understanding. It's amazing how when you learn a new idiom you suddenly hear it popping up in songs and films. The best thing about the book is that it is written not in a text book form listing words in lists, but rather as a series of experiences from the author's life in Moscow which makes it engaging and pleasurable to dive into at random points and find nuggets of information to be extracted and used. I keep it by my bed and last thing at night have a read. So I ordered this book off Amazon. It is interesting, filled with etymological explanations of a variety of phrases and words. And as previously mentioned, it is written as a quasi-memoir of an expat living in Moscow. But...I found it to be dealing with phrases and words that were beyond my level. This book is not for the beginner or even intermediate level student. I would suggest it only for advanced level guys trying to reach close to native fluency. I've put it on my bookshelf, and see myself picking it up again in maybe a year or two. I'm also reading this after Ligurian's recommendation. There's a lot of useful vocab as well as some intersting expressions but I do think it is best suited for advanced learners. I'll write a longer post with my impressions once I finish reading it. (04-01-2016 06:30 PM)Kissinger2014 Wrote: [ -> ] I found it to be dealing with phrases and words that were beyond my level. This book is not for the beginner or even intermediate level student. I would suggest it only for advanced level guys trying to reach close to native fluency. I've put it on my bookshelf, and see myself picking it up again in maybe a year or two. It certainly is not a book to have as your main go to textbook as a beginner. However I do believe that even a beginner can and even should be grabbing a few phrases and verbs from the book to spice up the learning process and interactions with native speakers. I do not understand what you mean by 'words were beyond my level'. It is no harder to learn the word hello or indiscriminate. You just use one more than the other. This is just my take, hear me out...It is my conviction that you can learn any phrase at any point in the language learning process. It is not at all linear. So for example as an intermediate learner myself I know phrases such as 'smashed to smithereens' or 'extenuating circumstances' but do not know certain words that would be classed as beginner words such as certain every day household items like comb or kettle for example. Now when I came across the phrase extenuating circumstances a few years ago in an sms from a friend should I have deliberately not learnt it because I did not yet know the word for comb? Do you see my point. There is nothing stopping a absolute beginner learning words such as 'Zanuda - Bore' or 'Rasslabsya - Chill out' ( no Russian keyboard on my computer ) for example. In fact those words are better than comb or kettle because they express thoughts and ideas that build connections. I can mimic boiling a kettle, it's very hard to mimic me calling someone a 'zanuda' when they say they don't want to drink alcohol. The road to competency is of course a wholly individual journey where you develop a system that you feel works for you personally. However I would not be so quick to put a book containing good information on the shelf for a couple of years. 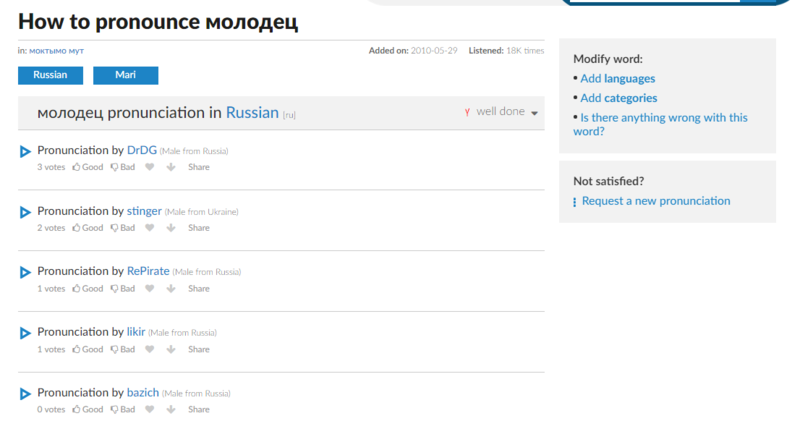 So this site has Russian songs along with the Russian and English text. I am hoping to find slower (meaning they are not ripping through words) songs that I can follow. While this is not the ideal song (when I become a cat), the pace is good. Can anyone recommend some current popular but slow songs? (04-14-2013 06:51 PM)Roosh Wrote: [ -> ] I will become proficient in this language. It must be done. Are you going to write articles for the Russian Kings Wiki as a way of improving your mastery of this language on an ongoing basis? If we can find a few other people to get involved, seeing contributions that can be improved-upon and that provide ideas for new content could be a good motivator. It could be considered a form of immersion. If you just want a bunch of phrases in Russian like I want to go to the supermarket, etc. This helps. I got the MP3s and just play them. I found the MP3s elsewhere don't remember the site, but I am sure you can get them here. Look for the table of contents on this page and press the arrows to change topics. (04-27-2016 12:29 PM)samsamsam Wrote: [ -> ] If you just want a bunch of phrases in Russian like I want to go to the supermarket, etc. This helps. Why is the verb "to go" (йдти) ommitted in these sentences? Shouldn't "Я хочу в библиотеку" be "Я хочу пойти в библиотеку"? I've skipped ahead to unit 2 of Pimsleur having finished two semesters of intensive Russian at university, and there are some things that already stand out to me, having now had formal language instruction. They say один час instead of simply час. They really abhor the perfective (for now at least) future, preferring the very Spanish resembling construction conjugated собираться + infinitive, like conj. ir a + inf. They also don't do the perfective past, which is more or less all I use now. It is probably difficult to explain aspect in just an audio program, but I was under the understanding that imperfective past is more like "I was in the process of seeing, reading, doing, walking, driving, when..." whereas the perfective future is what we usually see with "I saw him, I read the book, I walked to the store, I drove to Moscow, etc." They teach поесть for eating, which is perfective specifically to eat a little. I guess this is more polite? They say кое-что, which is something I never encountered, using что-то instead. They say должен is more of a must like нужен or надо, instead of a should. This could all happen in much later lessons, but since Roosh himself recommends this resource, I just wanted to bring up a couple things I noticed for those who are just using Pimsleur to get started with the intro lessons to bear in mind. Michel thomas is better than pimsleur for russian. When i used my pimsleur phrases i was often corrected and told i was using wrong words and sentences. It seems a bit out of touch. Its also very limited in terms of actually useful words, i found michel thomas to have given me both a better grasp of tenses and more useful words to use . Although pimsleurs method makes the words stick more. I'll just leave it here. This is a pretty cool music video. Awesome website I found when trying to figure out the pronounciation of words. Native speakers submit sound bite pronunciations of the words.